A little while back I mentioned how I had read about a great defense against slugs. What I read is that chickens are great for eating bugs, they can get an out of control yard (mines not. Mostly.) in control in no time. Cool! But, you know, who would go buy chickens when they live in a neighborhood with a crazy strict HOA? So I kept reading and asked my dad to find out about the HOA since he used to be on the board or something. I read that chicken poop is great for gardens, and chickens in general are great for composting. Not the birds themselves (gross) the fact that they scratch around all day pooping nitrogen and eating things like weeds and bugs. The scratching and eating part helps break down everything into a nice compost. Also, I read they don’t really take all that much time. Once they’re big enough to move outside into a coop anyways. 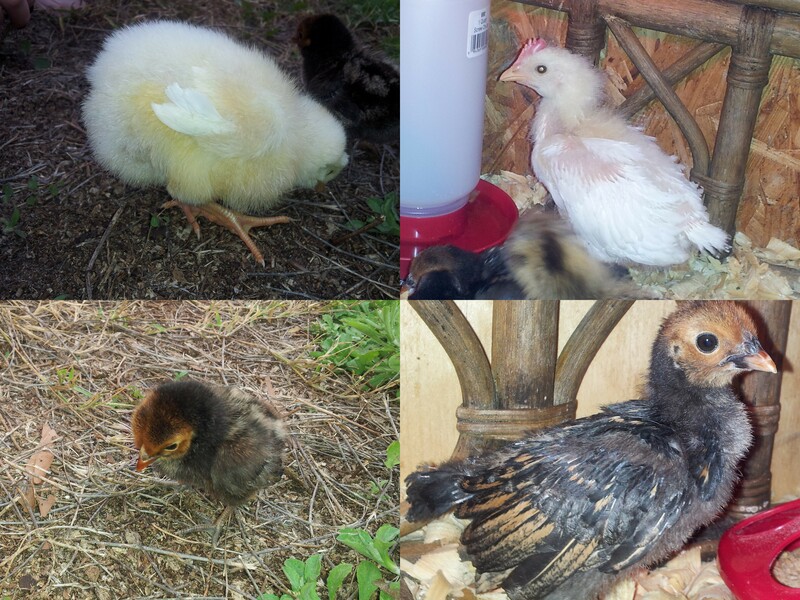 Also, my dad found out for me that I can have a limited number of hens, just no roosters. And so I went and got 4 little tiny baby chicks. Look how these 2 have grown in less than 3 weeks! Nugget (my daughter named her(?)) already has a comb on her head! I’m afraid that may mean she’s a he. The didn’t even have feathers when we got them, just fuzz and now they are in an awkward in between stage. Still cute though! This weekend I build the coop, I’m pretty excited about it since I’ve never made anything like that before. Another adventure! So far the chicks have been fun and my kids are already thinking a little more about where their food is coming from, without any prodding from me at all. Have you ever had chickens or other outside birds? Would you? Nothing against CHICKS but it sounds as though your HOA is sexist ! I expect that what you are doing will become more prevalent and although there are pros and cons I think that on balance it is a positive development. Haha, it’s the whole county that says no roosters. I hope I didn’t accidentally get one! If so maybe he’ll be that 1 quiet one? Yes, I know all about chickens – I grew up on a chicken farm before all of today’s regulations – fast forward – what are you going to do with the chickens when they get old (homegrown, organic chickens make the best soup stock in the world. I’m vegetarian – they’ll kind of just be pets that help me compost and hopefully eat tons of bugs. I keep hearing how interesting they are to watch, I guess I’ll see. How cute! My neighbor has chickens and the kids love to go visit them. She insists they’re easy to take care of, but I’m happy letting my kids benefit from her chicks without having to build my own coop! Hah, so far they have been fairly easy, a lot easier than puppies! I had a co-worker who raised chickens but he raised them to eat them and did his own slaughtering. I think i will stick to dogs. Mine are in a slaughter free zone. My dogs are still very strong favorites though! Chickens are cute. When I was a kid we had one and loved it. Unfortunately it died. Good luck! This reminds me of one of my late uncle who used to have a small farm in his backyard. What i didn’t like (infact I do not like it even now) was the idea of slaughtering those poor creatures just for the sake of a nice dish!! I had considered doing this, but alas, my neighborhood won’t allow chickens of any kind. I do know they are great bug and aphid eaters. BTW: Yours are just so dang cute.